A hand-crafted cabin and outdoor enthusiast's dream. Misty Morning located at Laurel Fork Rustic Retreat in Jamestown, TN is a spacious, 1,536 sq. ft. cabin with three bedrooms — to sleep 10 comfortably — and two full baths. Two bedrooms have king size beds and the third has two full size beds. There is also a full-size sleeper sofa in the living room and a queen size bed in the loft. 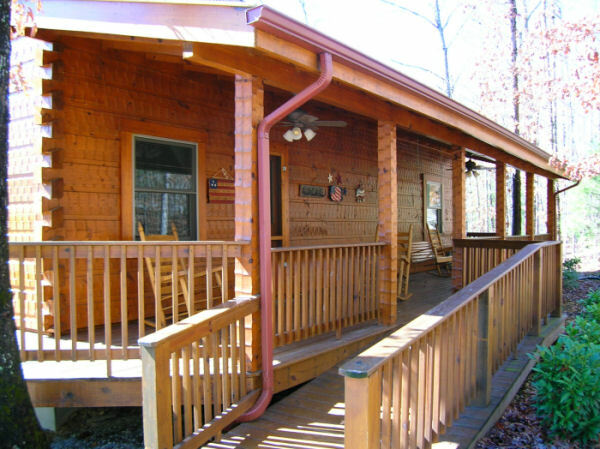 The cabin borders the Big South Fork National River & Recreation Area, with immediate access to Misty Cave and Misty Creek along a private trail. Be sure to bring your hiking boots, because hundreds of miles of trails within the 123,000-acre national park are also located close by, featuring a number of scenic landmarks such as mountain streams, waterfalls, rock houses, natural arches and more. Misty Mornings features include cathedral ceilings, a stacked-stone gas fireplace, hand-crafted log staircases, wheelchair ramp and handicap-accessible shower and vanity on first floor, outdoor fire pit and much more. Enjoy your own personal LUXURY HOT TUB while star-gazing on the back porch. You may also enjoy a game of air hockey or Horseshoes with your family and friends. Misty Morning also features 12 Mbps High Speed Wireless Internet along with local cable television. There are 3 flat screen televisions in the cabin 2 of which have local cable television and the other is a Smart TV located in the bedroom with 2 full size beds (great for kids). There are stables on site for horses, and pets are welcome*. Request a reservation at one of our cabins by using the reservation request form below. Submitting the reservation request form is not confirmation of a reservation; the reservation will be confirmed through an email. A fifty (50) percent deposit will be charged when the reservation is made, with the remaining amount charged one month prior to your arrival date. If request is summited less than one month before check in date the full amount will be charged. If you summit a request and include credit card information you are asking us to process the reservation. After the reservation is processed there will be a $50 fee to cancel. For specific price quotes please Contact Us. BEFORE SUBMITTING THE RESERVATION REQUEST FORM, PLEASE CHECK AVAILABILITY AND READ OUR POLICIES & FAQ. *Washer-Dryer: Bring your own detergent for washer. **Firewood for sale on site adjacent to retreat entrance. Immediate access to Misty Cave and Misty Creek along your very own private trail. Misty Morning includes four 10 ft. by 10 ft. horse stalls at the cabin with water and electric. The fee is $12 per horse per day. A wire fenced wooded corral area is available for overflow horses ($6 per horse per day). No stallions (stud horses) are allowed — no exceptions. Items included with stall rentals include water, electricity, manure fork, shovel, rake and wheelbarrow. Renters are required to provide their own feed, feeding and watering buckets and bedding. Renters must clean the stall(s) upon departure. In order to keep the facility clean, well maintained and low-priced, a $15 fee per stall will be charged if not cleaned upon departure! Rates for Misty Morning are $160 + tax per night for up to 4 people. Adults over 4 are $20 per person per night; children under 12 are $5 per night. ATTENTION: additional people must be declared and payment arranged before check in. There is a $60 cleaning fee and a $30 non-refundable processing fee per reservation. A $12 fee applies per horse per day. A $25 fee applies per pet per visit (limit: 2 pets).